Few things in technology are guaranteed to bring you actual joy, but Creative’s Super X-Fi just might qualify for that list. 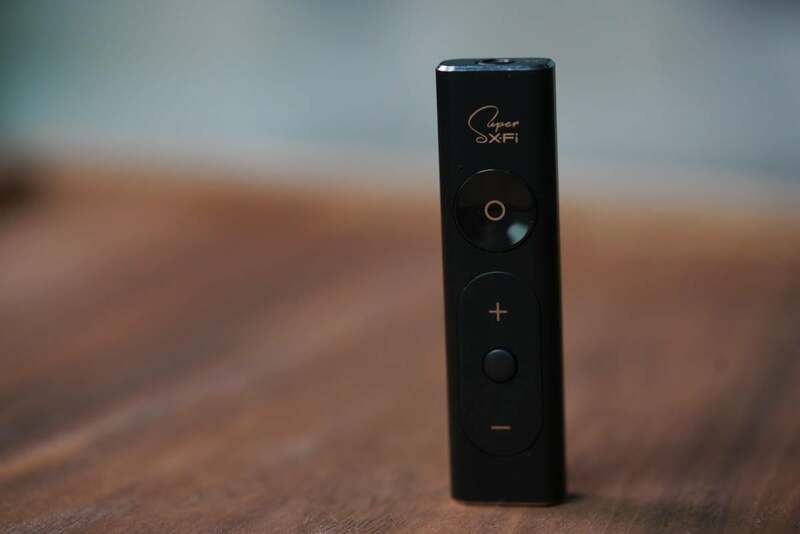 In short, the Super X-Fi distills decades of audio work into a tiny, portable dongle no bigger than a USB thumb drive that transforms smartphone, laptop, or PC audio with “holographic audio,” according the company. While that sounds like a lot of superfluous ad copy, we have to admit that after weeks of using the Super X-Fi, the company is on to something. 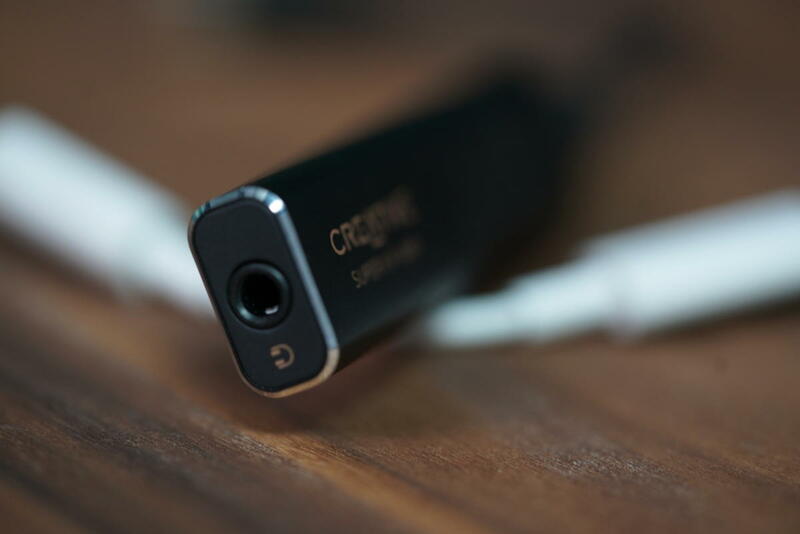 We’d almost believe Creative’s claim that it has found the “holy grail” of audio, but we’re disinclined to recall the Quest Knights just yet. The Super X-Fi (right) is the size of a finger but offers far more advanced audio than the Google Pixel 2XL audio dongle (v1) on the left. 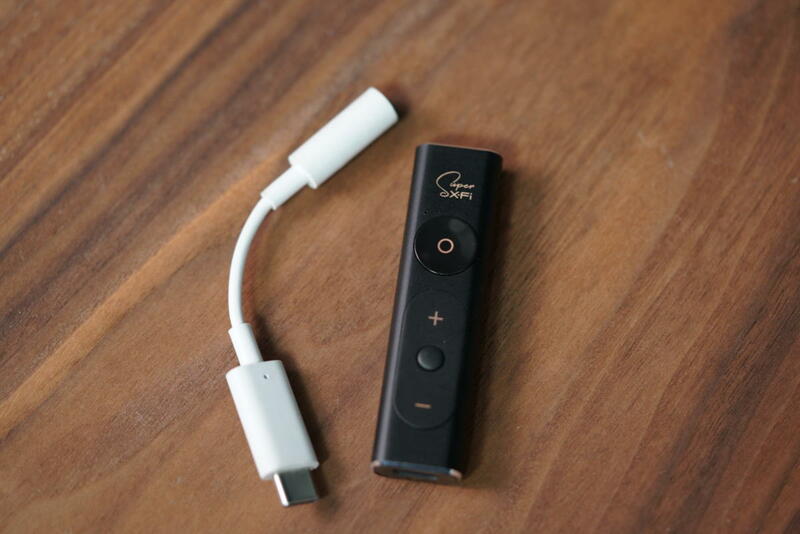 The Super X-Fi features a USB-C port on one end, a standard 3.5mm analog jack on the other, and features volume, shuffle, and a single control button on its surface. A tiny LED changes state from green to orange to let you know if it’s at work or not. To get started with the Super X-Fi, you first download an Android app though the GooglePlay store. You then take pictures of your head which is analyzed by Creative to pick the perfect audio profile for your particular head shape. This is necessary because so much of how we hear sound is determined by the timing differences of audio arriving in our ears, and the shape of our head and earlobes plays a large part of it. 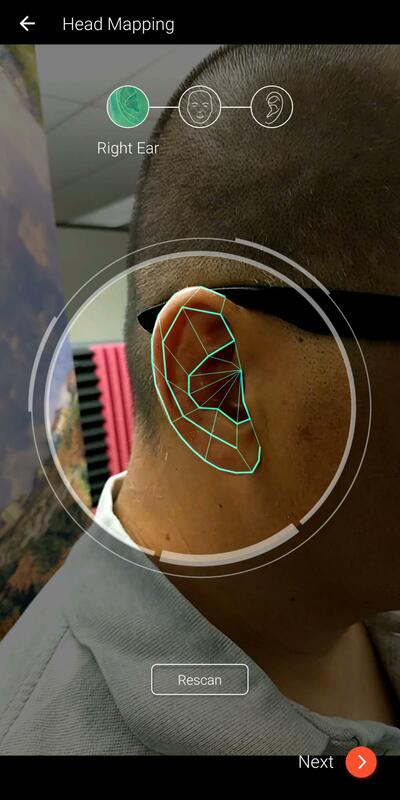 The Super X-Fi app scans your head to determine what is optimimal for you. Besides profiling for your head, you also pick from a set of listed approved headphones in the app, or set it to “generic” for either headphone or in-ear. The headphone profiles are fine tuned by Creative to make the most of each pair’s sonic characteristics and fit style. Creative actually has an even more optimized approach for mapping that uses in-ear microphones to precisely model audio for your head while frequency sweeps are run on a surround system. Obviously, this isn’t something that’s currently feasible for your average consumer. But we can say that in demonstrations of the Super X-Fi mapped using the in-ear microphones, we had a tough time distinguishing the Super X-Fi from a decently high-end Dolby Atmos system. For now, the head scans using a phone camera are the next best thing. Having that extra information is how Creative distinguishes the Super X-Fi from all other spatialized audio solutions. Creative expects its algorithms to get even better still as it adds more scans to its growing database. On one end is a USB-C port, and on the other is a 3.5mm jack, which many companies have banned from phones. Crack open the Super X-Fi and you’ll find an AK4377. That’s a 32-bit, 768KHz digital analog converter from acclaimed audio company Asahi Kasei Microdevices. The other chip is Creative’s Super X-Fi chip. The company is pretty secretive about what the Super X-Fi does exactly but we’d guess it relies on such technologies as Creative’s Crystalizer, CMSS, and dozens of other audio patents the company has in its war chest. Yes, true audiophiles who pursue the highest-resolution FLAC or DSD files will scoff at Creative’s bag of audio techniques as gimmicks or magic tricks, but in our listening experience, the Super X-Fi was nothing short of phenomenal. With stereo content over a good set of headphones or in-ear earphones, most music is rendered as if a singer or band is inside your skull. In fact, we’re so accustomed to this John Malkovich feeling that switching on the Super X-Fi may throw you off for a second or three. If you keep listening though, you’ll eventually realize you’re just not used to the sound of a band in front of your head, where they would be if they were performing for you. If we were writing Creative marketing lines, it would be easy to say that the Super X-Fi is like having a personal audition by musicians. Using whatever wizardry Creative has summoned from its library, there were times when the difference was stunning. It had us combing through our collection for more music to re-experience. 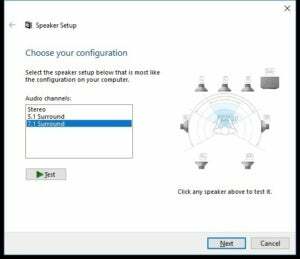 With the Super X-Fi in Windows, you set the OS to output as discrete 7.1 audio, which the dongle then reassembles positional audio from. Want to feel like you have an advantage in a multiplayer shooter? Want to be further immersed further in an open world? Plug that Super X-Fi into your PC and enjoy a 5.1 setup at the comfort of your desk with no pesky speakers or wires to worry about. Online games like Destiny 2, Battlefield V, and Call of Duty: Black Ops 4 worked like a dream and provided a level of feedback that made us feel as if we were cheating. When you can accurately place a sound without any visual feedback and respond to it, it becomes a game changer. Did it make us a better player? No, it’s not magic. But it did give us a deeper sense of our surroundings than we’d experienced before. The Super X-Fi will also pass microphone data as well, for when you are teaming up with your buddies. The spatialized sound even increased the immersiveness of single-player games like The Evil Within 2, DOOM, and Red Dead Redemption 2 (gasp—a console game). Yes, the Super X-Fi also works with the PlayStation 4 and Nintendo Switch, but not on the Xbox One due to current restrictions from Microsoft. We’ve been using the Super X-Fi primarily to play games for two months and it’s become a must-have. In situations where a dedicated 5.1 sound system isn’t an option, the Super X-Fi is the next-best thing whether you’re playing on a TV or PC. And for those who are worried about Creative drivers, have no fear, this is plug-and-play—meaning you can’t blame the company anymore if your build locks up mid-match! Be forewarned, the Super X-Fi is not perfect by any stretch. As we said, there will be times when you’ll be floored by just how good the Super X-Fi sounds. But there will also be times when it’s just meh, or even just wrong. Maybe a pinch too much reverb, maybe the vocals are processed out as a little too thin. Android users will also be annoyed by the device asking for permission to access the Super X-Fi (Creative says it’s a security limitation imposed by the OS). There also isn’t much customization in how much depth you can add to the spatialization. In future iterations we’d love to see the ability to push the “speakers” out further, or adjust how much reverb is in the space with you. Fine-tuning like this can further trick the brain to accept you are indeed listening to speakers in the space with you. Fortunately, in situations where the Super X-Fi’s processing isn’t working for you, you can click a button on the device to switch it off. You’ll still get the benefits of a 120dB SNR, 32-bit AKM DAC, which is likely a big improvement over anything built into your phone or laptop, or the generic dongle that came with your phone. it really is Mike Levine, the previous senior outcomes specialist at LucasArts and the cutting-edge CEO of mobile recreation developer happy large. Levine is running on a brand new venture with Corey Rosen,the former creature-effects manager at commercial mild & Magic, and mythical monster clothier Phil Tippett — the man who created Holochess for the authentic superstar Wars: a brand new hope.collectively those sci-fi comrades are building HoloGrid: Monster war, a tactical collectible card recreationthat takes numerous cues from the classic Holochess scene. forty years on, big name Wars nonetheless exerts a big impact on Tippett’s life. he is not disillusioned that superstar Wars hijacked his profession direction all of those years ago.alternatively, Tippett embraces it. HoloGrid is a mobile sport that makes use of bodily playing cards, andit’ll evolve into a digital reality and augmented reality revel in: basically, it will look a lot like Holochess. Tippett and friends are asking for $one hundred,000 on Kickstarter to make the game, and that they plan to launch it as a boxed, fixed–charge product (no unfastened-to-play microtransactions). it will additionallycome with a physical recreation board that permits purists to play with none technological gimmicks in any respect. For all and sundry else, HoloGrid comes with a stand for a cellphone or pill showcasing a freeapp that brings the game to life. players construct their decks, deciding on minions, spells and monsters from various instructions, after which experiment of their cards the usage of the app. The creatures then come to lifestyles on-display — in a familiar manner. Tippett designed all of the monsters in HoloGrid, and they’re now not simply 3-d renderings. He createdphysical, six-inch fashions of each monster in the game after which transferred the ones into the digitalrealm the usage of photogrammetry — snapping detailed, 360-degree images of each creature. it’s theidentical technique Tippett used to recreate the Holochess scene in 2015’s famous person Wars: Theforce Awakens. J.J. Abrams, the director of The force Awakens, wanted to feature the authentic Holochess creatures in thenew film, so Tippett went on a challenge to collect and rebuild the models he made within the 1970s.superstar Wars author George Lucas had a few, of direction. once the crew had wrapped the Holochess scene in a new desire, they encased the round recreation board and its creatures in a plaque and offered it to Lucas as present. The unique Holochess scene become simply a ultimate-minute addition to a brand new wish. Tippett had a prevent–motion puppet — some thing he’d made while he changed into sixteen — on set, and itinspired Lucas to apply the equal technique for a futuristic recreation of chess. This became close to thestop of the manufacturing agenda, so Tippett and his team moved quickly to create and shoot a forged of monsters engaged in an illogical yet instantly traditional in shape of approach and muscle. It took abouttwo weeks to create the creatures. however rebuilding those monsters for The pressure Awakens took months. Lucas had some of them, and so did The Lord of the earrings director Peter Jackson. The creatures in HoloGrid aren’t primarily based on any of Tippett’s big name Wars designs — some ofthem are unused fashions from his preceding works, like the quick movie Mad God, and others are ultra-modern. once fact catches as much as the guarantees of generation, Tippett, Levine and Rosen envision HoloGrid as a actual–lifestyles model of a new wish‘s Holochess recreation. 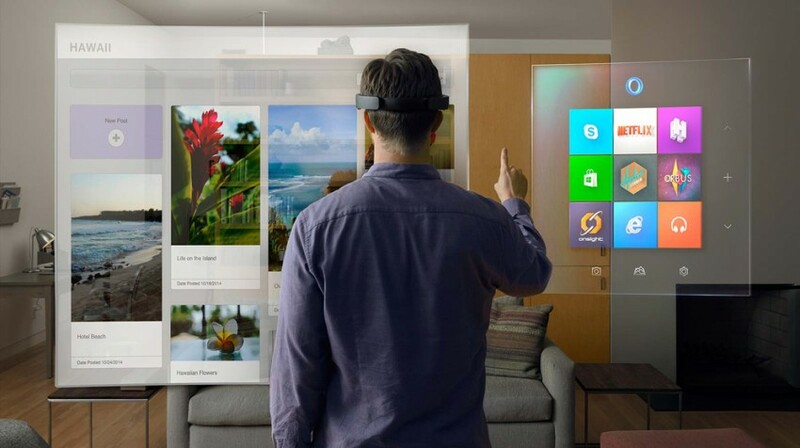 AR is the intention and thefuture, as far as they see it. Levine acknowledges that VR is the next cool issue in sport tech, however he sees an extended shelflifestyles for AR reports. Tippett is enthusiastic about the prospects of AR, too.